Cycling Ulster is one of the four Provincial Federations and is charged with looking after affairs in the nine counties of Ulster. Cycling Ulster is governed by an Executive. Why become a Member of Cycling Ireland? There has been a marked increase in cycling in recent years partly because of the success of the Cycle/Bike to Work Schemes and more and more people are now using their bike to commute to work. Many of these want to extend their cycling activities and perhaps turn to doing regular leisure rides. However many do not know where to go next and are perhaps wary of joining a club. To become a member of Cycling Ireland you do not need to become a member of any particular club but the main advantage for cyclists is that each member is covered by third party public liability insurance and also receives a small personal accident insurance. Both of these are very important things to consider as any accident can be very expensive if not covered by insurance. Membershp for most licence types is generally cheaper if you join a club although clubs usually charge a small membership fee on top of the licence fee. As a member you have the benefits of Cycling Ireland's Insurance package. Clubs who are promoting an open race event at the weekend may also include a 'club' race for riders aged 50+ and/or women. Riders falling into these categories can ride these events using a club competition licence. This is to provide the opportunity for older riders and women to try out racing on a less expensive licence. The 50+ events started in Ulster in 2011 and proved to be a great success. It allows those who are perhaps not fit enough to compete in full open event to experience competition against riders from other clubs. These events tend to be shorter than a full competitive event. With many new cyclists coming from other sports where they used to be competitive, the 50+ races prolongs competitive life and are also great fun. There are over 130 clubs in Ulster, the majority of which cater for both road and off road riders. The majority of clubs have a leisure section as well as a competitive section. You can view the Ulster clubs in the Club Links on the right of the Home page. Look around and ask questions before committing to a club to find out which one is right for you. Many clubs will allow newcomers to join them for a cycle so you can get the ‘feel’ of a club before joining. Most clubs organise training runs at the weekend or midweek and these are often split to cater for different ability groups. These runs add an extra dimension to your cycling as they provide a social aspect and the opportunity to make friends and learn more about cycling. There is something to look forward to on a Saturday or Sunday morning if you know you are meeting up with friends for a cycle.Most cycling clubs will charge their members a small fee on top of the Cycling Ireland fee. This is to boost club funds which is then put back into the club for the benefit of its members.Riding in a group is very different than riding alone or with a friend. There are skills to be acquired, dangers to spot and the basic etiquette of group riding to be learned. 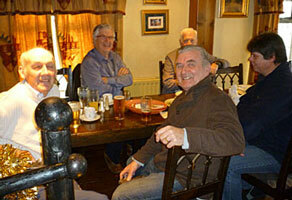 For those of you who want to find out more about riding in a groups see A Guide to Group Riding by Colin Hughes. 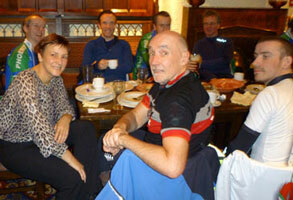 Club social runs are good fun and an opportunity for members to meet up after a cycle and have some craic over food. Increasingly clubs are beginning to organise informative evenings for their members with talks on bike maintenance, nutrition, winter training, safeguarding and sports psychology. Most clubs will also support riders intending to take part in the larger competitive events.Organised club weekend trips in Ireland are an increasing aspect to many club activities with clubs including cycling trips in scenic areas such as Donegal in their calendar. These trips provide an opportunity for riders to see new places and cycle on new roads as well as having a social side.Social training camps in warm weather venues abroad such as Mallorca are becoming the norm for many clubs while others also offer trips to major European cycling events. This could be a weekend trip to see the Paris -Roubaix or a longer trip to take part in a European Sportive.Training on your own in a gym or on a turbo trainer during bad weather can be a very boring activity. 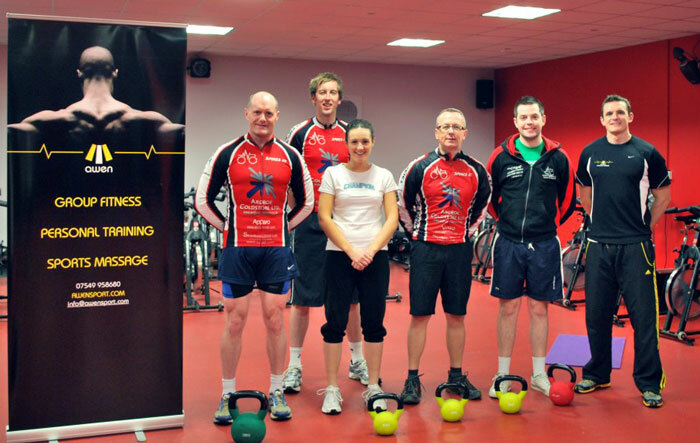 Many clubs now organise club spinning classes or gym training. Such sessions are more enjoyable as they are shared with friends and the time goes quicker. Sometimes these events take place in gyms, local halls or schools while others are carried out at home with a small group of people. To join any club you must affiliate to Cycling Ireland which is the internationally recognised authority for the control of cycling in the island of Ireland. Students in third level education receive a 50% reduction on most licences fees and there is now a new family leisure licence which covers two adults and two children. New for 2016 is a non-cycling licence for exiting members only. 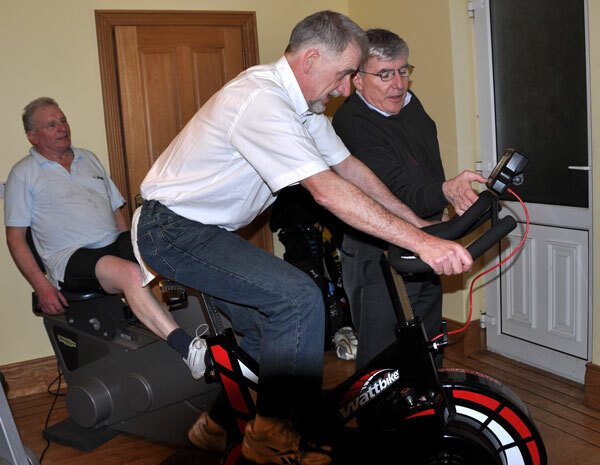 This is ideal for those members who want to join your club as administrators or volunteers but who do not cycle. To find out how to become a member of Cycling Ireland click the link below. You do not have to join a club although some of the licence types are more expensive if you are Unattached (not in a club). Remember when completing the application form you can choose your nationality eg Irl or GBR. Those from other countries such as Latvia, Romania and France can use the drop down menu to choose their nationality. Your licence code will be printed on your licence and is called your UCI Code.Choosing your nationality is important if you intend to compete in National Championships as the code on your licence determines which country's championship you can enter. Only those with IRL on their licence can take part in Irish National Championships. Those with GBR would need to enter the British Championships. This is a rule laid down by the International Governing Body the UCI and is not a Cycling Ireland rule.To take part in Ulster Championships this rule does not apply. Ulster Championships are open to those with an appropriate licence who are associated with the Province. 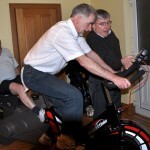 The full rules regarding this can be found in the Cycling Ireland Technical Rules and Regulations.